Home/Events, Graffiti Art, Mural Production, Team Building Workshops, Uncategorized/Vertical gets into graff! Learning how to both perfect their graffiti writer tag using markers and spray paint on a plastic wall we engineered outside, an early-rising team from Vertical took 1AM by storm. 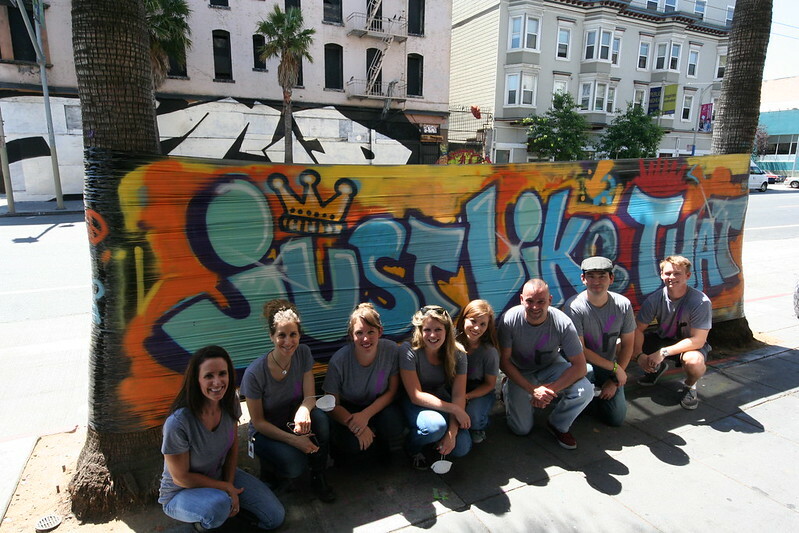 While they didn’t choose to take a canvas mural home with them to their office, they did however help paint an old-school mural outside with the phrase “Just like that” boldly emblazoned across it, which ultimately turned out great. Send us an email at privateevents@1amsf.com to get the conversation started about your next team or department event!